We are a group of 4 sophomores in high school who have little to no experience with coding. But we wanted to have some fun and learn in the process. 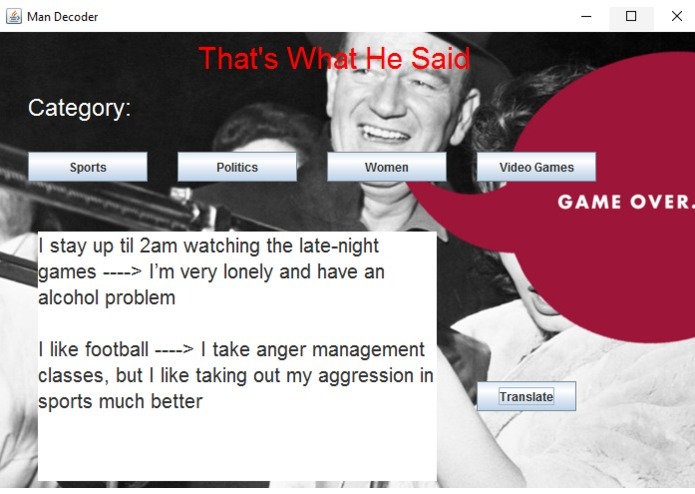 We decided to make a GUI (Graphical User Interface) that served as a translator of common things men say and what they really mean. It's meant as a satirical work, not to be taken too seriously. We were inspired by men around us who say these things but don't tell us their real thoughts. 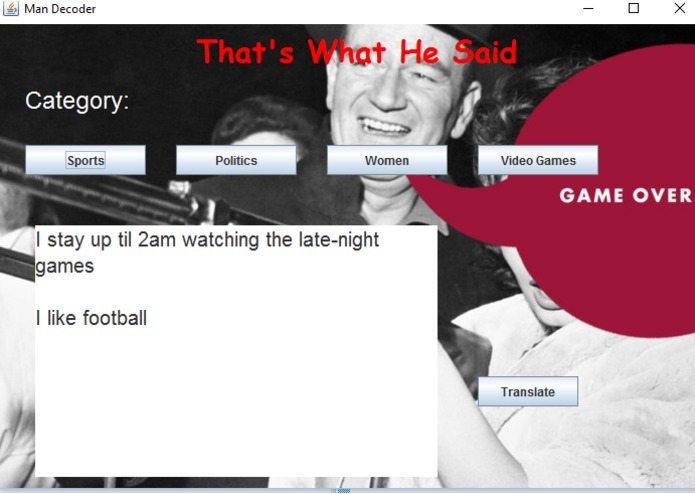 The GUI has categories under which phrases men say are located. Upon clicking translate, the "real" meaning shows up. Most of us have no coding experience, but we pushed along using Java. We used Eclipse to code a simple GUI. Due to our lack of knowledge in coding, we struggled with some tasks. We had to learn first, before we could code anything. We're proud of how much we've learned in these past two days. It's incredible to see us making a GUI when before bitcamp some of us did not know what Java was at all! We learned Java. We also learned how difficult but rewarding coding can be! Our GUI was meant as a fun, small project. But if people are willing to watch this project and contribute, feel free to message us! I worked on Eclipse using Java to make the GUI. I also provided ideas for the translations. Hi! My name is Xiwei Peng, and I enjoy working on fun, coding projects with my friends!